Spring semester is just settling in and our brothers have already made their presence known on campus. 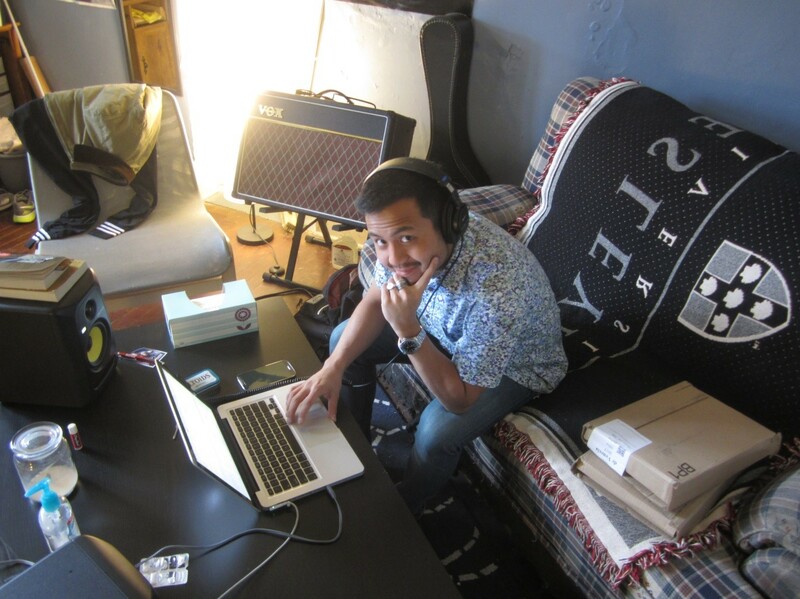 Our current Archon, Jaime de Venecia ’15 (pictured above) put out his first full length album, 重量(weight), late last fall, and it will be featured in this semester’s issue of the Wesleyan student music publication, Waves. A culmination of ten months of work, 重量(weight) is Jaime’s first fully formed and carefully polished musical idea. It was quickly picked up by several music blogs and has been hailed for its combination of dream-pop sounds and heavy lyrics. 重量(weight) is entirely original and can be found at Jaime’s bandcamp http://jdvplus.bandcamp.com/album/weight. In a similar vein, ex-Archon Simon Riker ’14 has been writing an original music comedy for the past four years and he is finally bringing it to the stage this spring. The play, titled Me Prometheus, is about the discovery of fire. It will feature brother Brett Klapper ’16 in its cast, as well as a full pit band including brother Riley Loftus ’16 and Jack Reuter '16 on drums and keys, respectively. This will be Simon’s biggest work to date, the peak of his four great years at Wesleyan, and we are keen to see what he will create. The Wesleyan varsity squash team, captained by brother Zander Nassikas ’14 and driven by brothers Cameron Rahbar ’15, Mike Delalio ‘15, Blair Corbin ‘15, Johnny Bebbington '16, Raheem Logan ‘16, and Chris Hart ’17 beat Brown University for the first time since 1967 this past winter. It has been a powerful season so far for the team. We are currently ranked 16th in the nation, which is the highest position we have ever been in, and we have high hopes for the upcoming NESCAC playoffs. Dan Brugioni '15 was also once again named captain of the rugby team, making it his third season in a row in that role. We look forward to see what he and the team, including brothers Alexander Nuñez ’14, Nate Josephs 14’, Jackson Ulrich ‘14, Felipe DaCosta ’15, Ali Shajrawi ’15, Bryan Bennis ’15, Blake Valenzuela ’15, Zach Breslin ’16, and Anthony Barker ’16, will produce this semester. Felipe DaCosta ’15 was recently accepted into the Mellon Mays Research Fellowship. Mellon Mays is a prestigious program which encourages diversity in higher education, and they will be funding Felipe’s work in sociological research this semester. This is an awesome gateway into graduate school for Felipe, who hopes to eventually earn his Ph.D. in sociology. Felipe will be presenting at a symposium of writing and research at Yale University next month.